Provasil is a natural product designed to help improve cognitive ability and mental performance. By supporting memory, focus, and concentration, Provasil claims to help users feel more mentally alert and reduce mental fatigue, brain fog and poor recall. What Provasil Claims To Do? The natural ingredients used in Provasil are specifically designed to improve several areas of cognitive health without the use of harmful or addictive prescription medications. However, the Provasil formula is maximum-strength and uses pharmaceutical-grade ingredients that have been extensively tested in scientific studies. Using Provasil on a regular basis may support better memory, prolonged periods of focus and concentration, the ability to retain new information, reduce irritability and help the individual feel more alert and motivated. Certain ingredients also provide antioxidant protection for the cell membrane, keeping free radical damage at bay even as the body ages. What are the Key Ingredients in Provasil? Vitamin C provides support for the immune system and is a potent antioxidant. It is important for neuron development which has a direct effect on memory creation. Folic Acid declines as the body ages so it is vital to supplement it in the diet. By doing so, memory, language and information processing may be supported. Biotin is linked to the production of neurotransmitters which help relay information to and from the brain. It also keeps the central nervous system functioning at an optimal level. L-Tyrosine is an amino acid that supports proper brain function even during periods of stress. Ginkgo Biloba is a natural botanical that is often found in nootropic formulas such as Provasil. With the ability to support better circulation, the brain receives a larger amount of oxygen which in turn helps it function optimally. Phosphatidylserine has been extensively studied for its use in age-related cognitive decline and plays an important role in many brain processes. Resveratrol is a natural substance that most people recognize as a heart-healthy antioxidant found in wine. As a nootropic ingredient, it is said to have a positive impact on long term memory in addition to its anti-inflammatory effects. N-Acetyl-L-Carnitine is an extremely potent antioxidant that supports levels of Acetylcholine in the brain. By eliminating harmful free radicals, it keeps the brain cells healthy and free from oxidative stress. By combining these vital nootropic ingredients, Provasil keeps the brain working at its maximum level even as it ages. It is beneficial for younger individuals who need to study or stay mentally alert at work, but it is equally useful for older people who may have noticed an increase in brain fog, poor recall and an overall decline in their cognitive health. While no clinical study results are provided for the Provasil formula as a whole, several of the key active ingredients have undergone extensive testing with positive results. What are the Advantages of Provasil? How Much Does Provasil Cost and Offers? One bottle of Provasil costs $49.95 and the manufacturer provides package deals on larger purchases. Free gifts are included with certain purchases and free shipping is offered on orders over $60.00. Click here to read more information about Provasil. 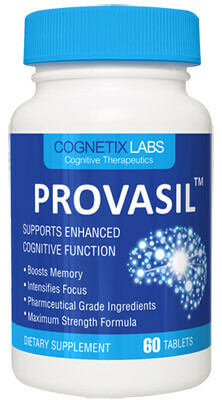 Provasil should be taken at a dose of 1-2 capsules any time of the day when increased cognitive function is required. For some people, this may be the first thing in the morning, for others, later in the day. How Provasil Improve Your Mental Performance? Provasil provides a comprehensive formula that gives the brain all the ingredients it needs to stay healthy and free of oxidative damage. Because it benefits so many areas of cognitive function, it can be used by people of all lifestyles and ages whether they need help with memory, recall and eliminating brain fog, or simply an added edge when it comes to daily activities. Because it has a cumulative effect, it becomes more potent with use to provide sustained results. Memory decline, confusion, and brain fog are natural as we age but can be extremely distressing as is the inability to retain information and concentrate for long periods of time. Used on a regular basis, Provasil may overcome the negative aspects of age and a busy lifestyle and, because it is made by a reputable company and extensively tested for safety and performance, the user can feel confident that it won’t lead to addiction or dangerous side effects. While there are no free samples available, consumers can try the product for 60-days risk-free, to see for themselves how well Provasil works for their cognitive health. I recently started taking Provasil and within the first two weeks I noticed a remarkable difference in my focus and concentration. I cannot wait to see what taking this product for a couple of months will do for me. I feel like my brain just gets a boost and my mental fog seems to be gone. I have been taking Provasil for several years and it is my proven, go-to supplement, especially when I need a boost to my mental focus and processing speeds. I like that I can take it twice a day, if needed. I can either split the initial dose or double it on really bad days. I love that the boost is all natural. That is a big factor for me. In my opinion, Provasil is effective, yet subtle. When I find I have to do public speaking or give a presentation, the words I need just flow. There are less ums and uhs and my vocabulary is more precise. I guess when I was younger, I never thought I’d still be working at this age, but the retirement age has changed and I can’t plan on retiring very soon! In the meantime, I intend to use Provasil.